The church: Cornerstone, Tampa, Florida, USA. The building: Located at the University of South Florida, Cornerstone Christian Church meets in the Plaza Room at the Marshall Student Center, a large plain four-story structure somewhat resembling a shopping mall. The Plaza Room is plain but functional, with ample seating, projection screens and lecterns. The church members arrive early to set up, then pack and remove their equipment after the service. They have no plans to seek a permanent or church-owned facility. 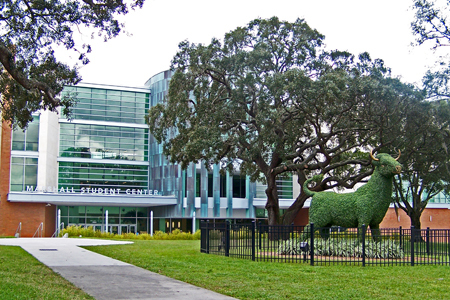 The church: The University of South Florida is large and growing, although overshadowed by other Florida schools with highly visible football and basketball teams. The church is almost completely young, ministering primarily to the student body. It sees as its mission to evangelize college students during a very crucial time in their lives and to establish them in churches outside the university community. There is one service each Sunday morning, as well as covenant groups and prayer meetings that take place at other times. The neighborhood: Tampa is located in western Florida on the Gulf of Mexico (the "Sun Coast"). The environment is semi-tropical, characterized by cloudless skies and palm trees. Near the college campus is the prestigious Moffitt Cancer Treatment Center, along with other hospitals. The streets are wide, with ample parking, and are lined with the ubiquitous fast food restaurants for students who seem to eat at all hours of the day and night. The cast: The Revd Bill Cooper, senior pastor, and special speaker John Steele, a senior leader with New Life Churches, New Zealand. The date & time: Sunday. October 17, 2009, 11.15am. Bulging at the seams with students, a few adults, and some children. Dress was informal in the extreme, but clean and presentable. One elderly couple, possibly faculty but in any case obviously well-regarded regulars, arrived in their "Sunday best." Yes, we passed a gauntlet of student greeters in the hallway. There were no pews; rather, stackable plastic chairs were provided, but they were comfortable enough. We arrived about 15 minutes early and sat down to watch the rehearsal of the praise band. We didn’t notice all the people waiting in the hall. Then suddenly the rehearsal was over and the place filled up. There was lots of greeting and talking, but a businesslike taking of seats. "Good morning. Find a seat and sit down." Words for the songs were available via projector, but there were no bulletins or other handouts. On the other hand, almost every participant brought and referenced a Bible; many brought notebooks and took extensive notes. We were sitting in the last row with the children, who were having a "meet and greet" of their own special variety. Also, the keyboard player almost never played the keyboard – she raised her hands in praise and kept them there. The praise was both happy and clappy; the exposition was earnest and detailed. The class (oops, congregation) was clearly paying attention. 10  A hour-long monologue delivered with an actor's skill. Life in God's kingdom, characterized by love. God's love makes us each part of his kingdom. We are valued as individuals, and a healthy enjoyment of our individuality is appropriate. It is not wrong to say, "I love being me!" We act as part of the kingdom by showing love to people we meet. The sermon – long, detailed, varied, but well-constructed. Apparently it was extemporaneous, and Mr Steele said afterward that it was nothing like what he had intended to say. One of the MoboJobo party is no fan of praise bands. Consider 10 (yes, 10) repetitions of "I love you Jesus," starting softly and ending with a fortissimo drum cadence and shouted like a football cheer. And that was characteristic of the previous hour, before the hour-long sermon. Yet this was not without humor. The keyboard player probably played a total of three notes. The rest of the time she raised her hands in praise. Waiting for the keyboard to be played was a useful distraction. We chatted with the speaker, the regular pastor, and several of the "older" members of the church – who were pushing 30. There was none. People, especially those with children under two, simply dispersed to get on with the logistics of sleepy/hungry offspring. 5  The praise band would be a big barrier, and to sample the speaker regularly we would have to move to New Zealand. That would be impractical. Normally, it would be the keyboard player. In this case, the long-but-worth-it sermon.